SEWARD, Alaska, June 10, 2013 (ENS) – “How sad it is that garbage and debris are what is calling us to wild shores,” Carl Safina said as he joined an international team of scientists, artists and educators in Seward on Friday. Dr. Safina and the others are taking part in Project Gyre, a marine debris expedition and exhibition of marine debris art from the giant rotating ocean current that is the North Pacific Gyre. The project is a collaboration between the Anchorage Museum and the Alaska SeaLife Center in Seward, a private, non-profit marine science facility. The team sailed out of Seward on June 7, aboard the research vessel R/V Norseman to study the global marine debris crisis as it affects the southwest Alaska coast. Headed 450 nautical miles west from Resurrection Bay along the Kenai Peninsula coast, they will cross the Kennedy Entrance channel to Shuyak and Afognak islands. The expedition includes representatives from the Smithsonian Institution, National Oceanic and Atmospheric Administration, National Geographic, Alaska Marine Stewardship Foundation, Anchorage Museum and Ocean Conservancy. 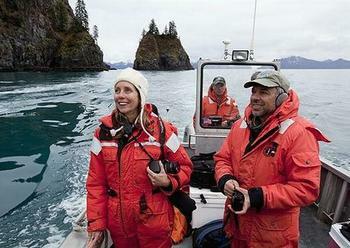 Howard Ferren of the Alaska SeaLife Center is heading the 1,000 mile long expedition. As they go the team will focus their attention on shoreline trash, and they’re finding plenty of that. Longobardi has seen more styrofoam balls and sponge-foam miniature sports balls – soccer, basketball and volleyballs – than any other type of trash on Alaska beaches. 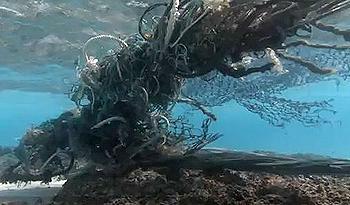 Phase two of the Gyre project culminates in a 7,500-square-foot “Gyre” art and science exhibition on view at the Anchorage Museum, scheduled for February 2014. Following its Anchorage debut, the “Gyre” exhibition will be repackaged by the Smithsonian Institution for a tour of the continental U.S. The Gyre expedition will end with an intensive cleanup of Hallo Bay in Alaska’s Katmai National Park, a remote area that has experienced an influx of debris from the March 2011 Japanese tsunami.